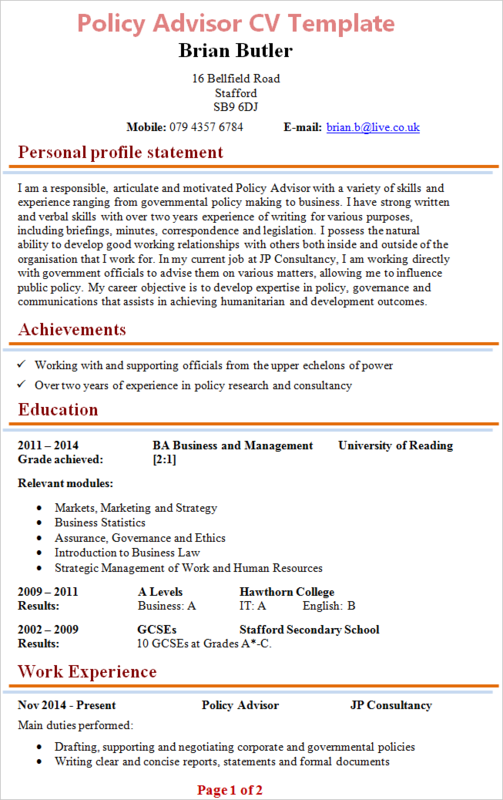 Tip: Use the Policy Advisor CV Template below as an example to help you write your own personal and fully-tailored CV. I am a responsible, articulate and motivated Policy Advisor with a variety of skills and experience ranging from governmental policy making to business. 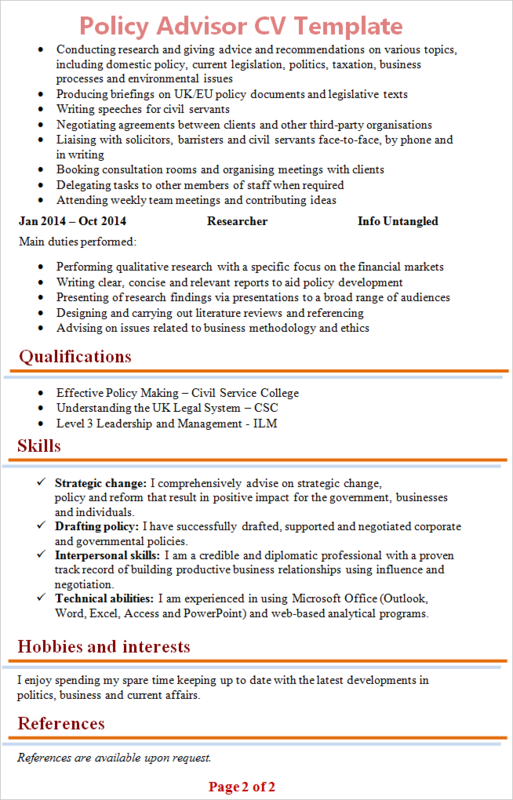 I have strong written and verbal skills with over two years experience of writing for various purposes, including briefings, minutes, correspondence and legislation. I possess the natural ability to develop good working relationships with others both inside and outside of the organisation that I work for. In my current job at JP Consultancy, I am working directly with government officials to advise them on various matters, allowing me to influence public policy. My career objective is to develop expertise in policy, governance and communications that assists in achieving humanitarian and development outcomes. Strategic change: I comprehensively advise on strategic change, policy and reform that result in a positive impact for the government, businesses and individuals. Drafting policy: I have successfully drafted, supported and negotiated corporate and governmental policies. Interpersonal skills: I am a credible and diplomatic professional with a proven track record of building productive business relationships using influence and negotiation. Technical abilities: I am experienced in using Microsoft Office (Outlook, Word, Excel, Access and PowerPoint) and web-based analytical programs. I enjoy spending my spare time keeping up to date with the latest developments in politics, business and current affairs.